chrysalis – jen wewers, m.div. 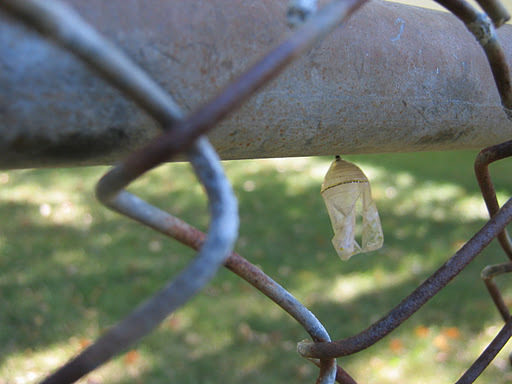 Like the child in the womb, the chrysalis represents a time of withdrawal and hiddenness. Nature draws a veil over the formation of new life. At precisely the right time, the caterpillar becoming butterfly encases itself and dies to the surrounding world . . . Human consciousness seems to demand similar cyclic renewal. As it does to the butterfly, life brings death and rebirth to all of us. I am living with my signs differently. A few weeks ago it was rapid fire. Lately, I feel called to sit with what I see and let its meaning grow in me. Max and a friend were playing football in the backyard when they found a piece of green jade hanging from the chain link fence. In such a barren and cold place a monarch caterpillar had decided the time had come to let go of her earthly life. The top of the chrysalis was rimmed in tiny gold beads. This sarcophagus so regal and solid looking. I watched. I witnessed. The cocoon changed. The environment of transition fed the butterfly as it formed. It lost its jeweled jade facade. Day after day it became increasingly translucent. Soon, I was watching the transformation as the wings took shape. The orange and black growing deeper and richer and more real every day. The butterfly came into being before my eyes. Late Sunday afternoon, I checked one more time and all seemed well. I thought I was still one day a way from witnessing the birth of this new monarch. Not her birth from her mother, but rather the miracle of giving birth to her newest self. It’s not the butterfly I am drawn to write about, but the space of transition. That space we need to cultivate in order to surrender to our next incarnation….our next level of beingness. That, for me, is the great lesson of the chrysalis in my backyard. As the form of the butterfly took shape. As her new beingness became more defined, the need for the cocoon lessened. The walls that held the space of transition became thinner and thinner. Perhaps it’s precisely by being attentive to the rhythm of our lives and allowing ourselves time away, that we eventually move more fully into the world. No barriers. I look in the mirror and see a woman who has built walls of flesh around her. I have weighed myself down, physically and psychically. I have held the fleshiness of the caterpillar, its rolls of skin slowly moving up my arm. I have planted milkweed, and watched them devour everything in its path. I know her ways. I know them well. But something in that caterpillar calls her to spin her cocoon and surrender to the transition. The milkweed consumed becomes that which feeds her as she grows into a butterfly. I project my story on to hers. Does the ground dwelling life just get too hard? Does she finally get tired of building walls around a life that no longer suits her? At what point does the unknown and its darkness beckon her to surrender? How does she know when she is ready to change? How does she know when it’s time to fly?